The one thing that all these messages have in common is that not one of them was meant for Yours Truly. Every one of these messages was intended for some other Leigh Ann. I thought it was pretty awesome when I got an early invitation to get a Gmail account back in 2005 or so, ahead of the crowd. I was even happier to know that "my name at gmail dot com" was available, and I snapped it up at once, but didn't use it or give it much thought. A year or so later I logged in, and something insidious had happened... there were thousands upon thousands of emails there. Somehow I'd gotten subscribed to newsletters from every department store you can think of, dozens of TV and Radio stations, auto dealerships, realtors, just about any place you can submit an email address, women and girls named Leigh Ann who thought their email addy was the generic Leigh Ann at Gmail dot com were subscribing. This wasn't the bad part. As I would try to clean these emails out of the Inbox, I would come across personal messages from people who thought that "their" Leigh Ann was at gmail.com. 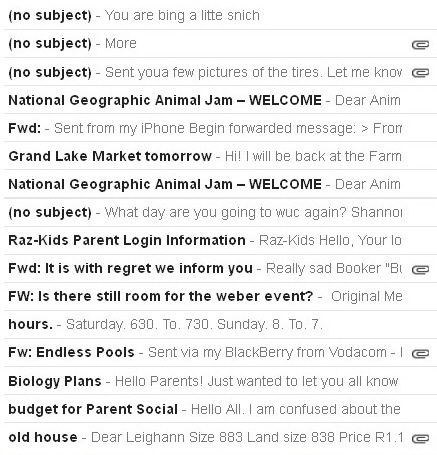 For a few months I would reply to these, letting the anguished friend or relative know that the Leigh Ann they were trying to reach wasn't ignoring them at all, but was actually at another email address. Before too long, the task became overwhelming and I began to ignore it altogether. Fast forward to 2013: My Gmail did what they once said couldn't be done: it started bouncing. So my New Years Resolution became to take back my Gmail. I've spent many hours unsubscribing and filtering messages straight to the Trash. And as I did this in bulk, every so often the personal messages would start coming through again... someone in 2009 offering condolences over a lost loved one of some other Leigh Ann... scorned lovers begging for another chance repeatedly, or just begging for a reply. Messages from dozens of teachers, ministers, contractors, and auto mechanics.... Invitations and e-cards and well-wishes by the hundreds, receipts for things and reservations. I'm trying to reply to the more recent messages, and steer the sender in the right direction. But if over the past six years or so somebody named Leigh Ann ignored the emails you sent to her Gmail, they might have just been going to the wrong Leigh Ann. It's a good thing my name isn't more common. Sorry I sent you that message . I'm rya. Maybe we could be blog friends?I would love to explore your blog even more. lease checko out my blog at http://aryasblg.weebly.com/.